Celery seed oil is extracted using the fresh or dried plant and its seeds in the steam distillation process. Celery seed oil comprises various chemical components such as sedanolide, sedanonic anhydride, d-limonene, selinene and sesquiterpene alcohols. Besides, it can also contain fatty acids like linoleic, myristic, palmitic, palmitoleic, stearic, petroselinic, oleic and myristoleic. Celery plant is a biennial plant that grows about 30 to 50 cm height. It has grooved, fleshy, erect stalk and skinny pinnant leaves. This plant has smooth stem, soft leaves and has white flowers. Celery seed oil is known for its antioxidative, anti rheumatic, antiseptic (urinary), antispasmodic and aperitif properties. Besides, it is also carminative, cholagogue, depurative, digestive diuretic, hepatic, nervine, stomachic, tonic (digestive), sedative (nervous) and stimulant (uterine) in nature. 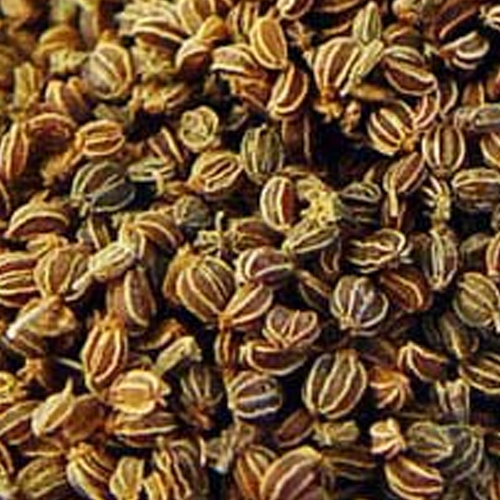 Celery seed is widely used in tonic, sedative and carminative preparations. Along with this, it is also used in cosmetics, soaps, detergents and perfumes as a fragrant agent. Moreover, it also has been used in the food and beverage industry as a flavouring agent especially in spices, alcohols and soft drinks. In the medical fraternity, it is widely used for treatment of cancer, diuretic, arthritis and as a sedative. Celery seed oil blends effectively with lavender, pine, opopanax, oak moss, lovage, Tea Tree and other spice oils. Though celery seed oil is consumed widely, it is allergic to some people. It should be avoided during pregnancy or breastfeeding. Celery oil is safe for human consumption as natural seasoning, spice and for weight-loss diets.